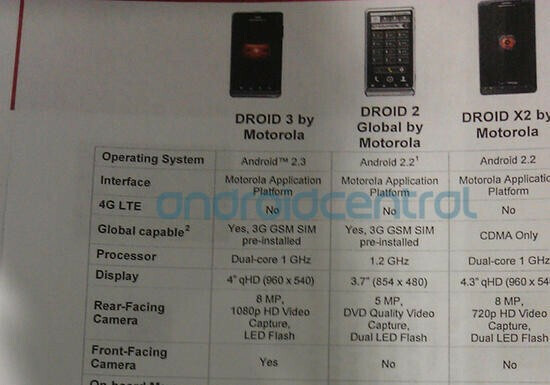 After weeks of speculation, the Motorola DROID 3 finally has some official specs released courtesy of a leak of Verizon's Product Guide. Much of what is listed for the unit has already been guessed correctly, like the 4inch qHD display, the dual-core 1GHz processor and the world phone functionality which means this beast launches with both a CDMA and GSM radio, and has a Sim card pre-installed. 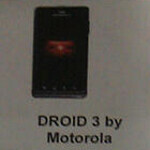 As we already surmised, the DROID 3 will not be an LTE enabled model. The 8MP camera on back has an LED flash and can capture video at 1080p. There is also a front facing camera for self-portrait and video chat. Android 2.3 is on board and 16GB of internal storage comes out of the box, expandable to 32GB with a microSD card. A 5 row-landscape facing QWERTY keyboard slides out and for those who use the virtual QWERTY, Swype comes pre-installed to make typing more fun and intuitive. Blockbuster service comes with the DROID 3, but it works on Wi-Fi only. VCast video is supported and it goes without saying that Adobe Flash is in the browser. 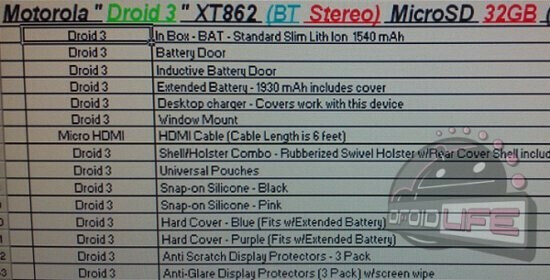 If you plan on buying the Motorola DROID 3, you might want to examine this leaked picture of the handset's accessories list leaked from Verizon. The list includes a 1930mAh extended battery, snap-on silicon covers, a hard case, a window mount and a holster. With the launch expected to come off on July 13th, time is ticking away so you better start thinking which extras you will want for your new Motorola DROID 3.
wait i don't understand why 8GB camera on the rear is funny. Please explain >. LOL my bad, you're right. My brain was still telling me 8MP even after reading it twice lol. No MicroSD card SLOT? If true, that's bull. But considering there's at least one other major error (8GB camera? Lol!) I'm guessing it just means there's no card included, but there's still a slot. There is a SD card slot. Just no SD card in there. Wouldn't u just want to put a larger 32 gig card in there anyway? It has an SD slot WITH a 16GB card pre-installed... expandable to 32GB. There is no sdcard pre-installed, it has 16 GB of internal memory and an sd slot so you can stick in a card for up to 32 GB more on top of the internal. Theres probably a place for microsd in the BACK of the phone where the battery goes like the first droid. i figured the Droid 2 eye would carry over like the Droid Inc. 2 and the Droid X2. oh well, this is still exciting news. :D i wish they knew how much RAM it has because now talk of 1GB is being thrown around. That would be my situation exactly. I already have a 32GB that I will just put in. What about boot loader? Locked? As far as I can see, there is nothing new to this spec list that we didn't already know with the exception (as far as I know) of 16GB installed memory with no external memory supplied (but expandable to 32GB). Shouldn't the GSM version, called Milestone 3, be the same exact phone? Motorola did this with Droid/ Milestone and Droid 2/ Milestone 2.
seems like the only difference is Verizon's Droid 3 will be powered by an OMAP4 processor while the European Milestone 3 will be powered by a Tegra II processor. Released on the 7th for direct fulfillment (order online), in stores on 7/14. will it have a keyboard ?